House of Secrets is one of the leading studios for computer and VR animation in the Netherlands. We excel in character animation, realism and virtual reality applications. Our services range from immersive experiences for museums and brands to full-scale virtual reality productions. With 12,5+ years of experience in visual effects and animation, having worked with international brands and Dutch television stations alike, House of Secrets now focuses on in-house animation productions for (interactive) immersive experiences. Traverse alien landscapes, battle your enemies and solve puzzles to find out your story in the virtual reality platformer KIN. House of Secrets presents a VR puzzle platformer game with combat elements that will have the player traverse the remnants of an ancient civilization on a distant planet. Throughout your journey through alien landscapes, a story will unfold. The game holds an abstract aesthetic that has become characteristic for the studio through their earlier VR experiences such as APEX and Surge. 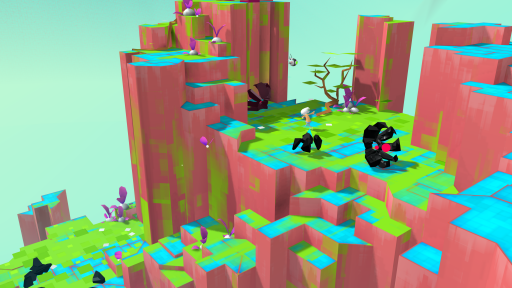 Lively colours, intuitive gameplay and interesting level design set the tone for KIN, in which the player moves through the world as a mysterious, tiny girl with big hair clad in a bright dress. Defeating enemies and solving puzzles, she leaps from platform to platform, travelling through different landscapes.